Marin Sanitary Service operates a dual-stream recycling program, meaning paper is collected separately from glass, plastic and metal containers. Collecting materials this way produces cleaner, higher-quality recycling material. For our residential customers, we provide split-carts for weekly recycling curbside service so that you can easily keep your recycling materials separated. The blue side of the split-cart is for paper and fiber recyclables, the brown side of the cart is for containers made of glass, aluminum and plastic. Please help us in reaching Marin’s zero waste goals by making sure that what you put into your recycling belongs there and not in the garbage or compost receptacles. Below we’ve listed some general guidelines about what can and cannot go into your recycling split-cart, but the list isn’t comprehensive. When in doubt, please use the Where Does It Go, Joe tool above to look up a what cart a specific item should go into. The blue side of the cart is for clean paper products only. Please keep all paper separate from other recyclables before placing in the split cart to prevent contamination. The brown cart is for clean bottles, cans and containers only. In this short video, we explain how the mantra “bottles, tubs, and jugs” will help ensure that you’re putting the right plastic in your recycling. Remember: keeping your film plastics out of your recycling may feel like a small contribution, but when it’s multiplied by the entire community, it makes an enormous difference! Extra recycling may be placed in a separate container or paper bag/box beside your recycling cart. Please keep paper products separate from your glass, plastic and aluminum containers. 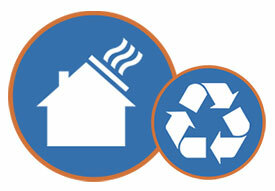 Extra recyclables are collected at no additional charge for our residential customers. If you find you consistently have extra recycling, please call our office and request to rent a second split cart for a nominal monthly fee. Extra cardboard is collected at no additional charge but must be broken down and either stacked into 2 ft x 2 ft x 2 ft bundles tied with twine or stacked into another small box. See Extras, Clean-ups, Bulky Items & Other Services for more information.